Cabinet & Chassis: One piece blow molded high-density polyethylene plastic. Resists cracking, fading and yellowing. Color molded into hide scrapes caused by rough usage. Easily removed for access to interior components. The shock absorbing base is of ABS plastic and will never rust. Cold Water Refrigeration Unit: Convection cooled condenser. 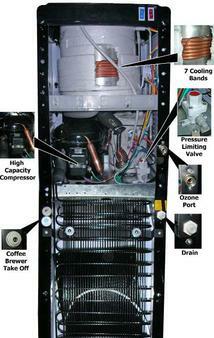 Internal, spring mounted, hermetically sealed compressor with automatic overload protector. No lubrication needed. Refrigerant is controlled accurately by a capillary tube. Cold Water Thermostat: Temperature is controlled by an adjustable thermostat with “OFF” position that is easily accessible on the rear of the unit. Water Cooling Reservoir: Food grade stainless steel type SUS304, 1 gallon (3.8 liter) reservoir. Provides superior chilling for great tasting water. Highly polished surface is easy to clean and maintain. Hot Water Tank: Food grade stainless steel type SUS304, 0.32 gallon (1.2 liter) capacity. The 520 watts heating element ensures precise temperature control. Removable thermostat and heating element makes service easy. Pressure Limiting Valve: The valve ensures inlet water pressure up to 150 PSI and ensures safe operation by limiting the outlet water pressure to be under 42 PSI. 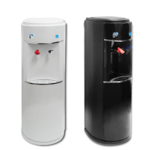 Energy Star: Water coolers in homes and businesses consume about 5 billion kWh/year. 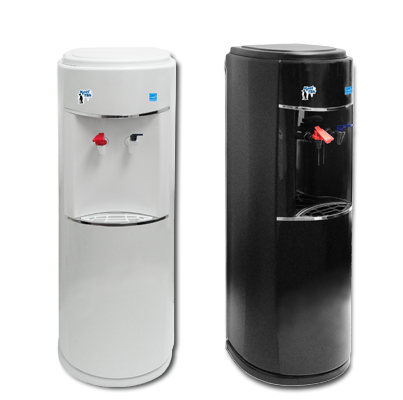 ENERGY STAR qualified water coolers use about half of the energy of standard models. Are you tired of lifting heavy, awkward, and messy water bottles? We now have the solution. KoolTek Water Coolers. With this new system we are able to eliminate 99% of contaminates, particulates and pollutants. With the ability of chilling and/or heating water already at your location. • No more lifting 50lb water bottles. • Quality that is superior to bottled water. • No more storage issues. • No more urgent last minute phone calls because you are out of water. your monthly fees can easily exceed $50.00 a month. We are offering a new low cost alternative. And as with all our equipment we install and maintain (including changing filters) at no additional cost to you.